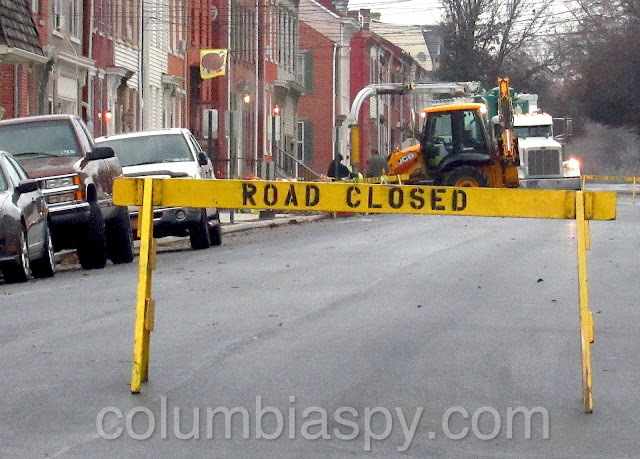 The 600 block of Walnut Street has been closed at various times this week for remedial work. 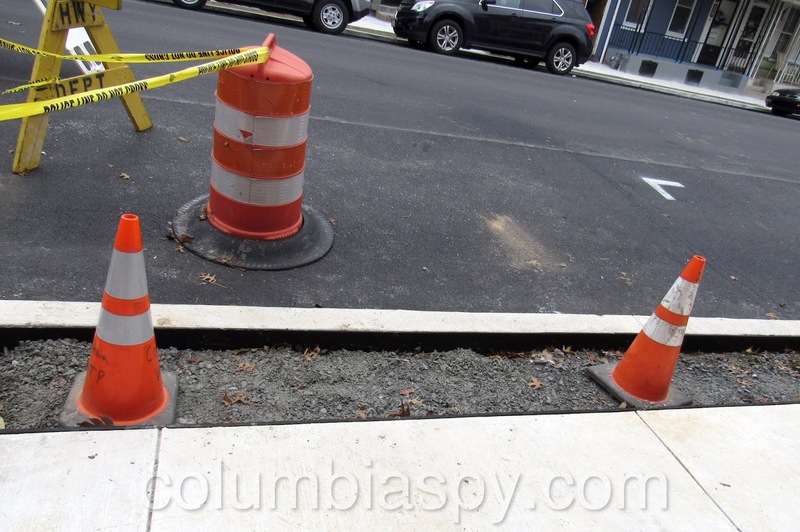 Contractors are currently scrambling to finish remedial work on several Walnut Street sidewalks. 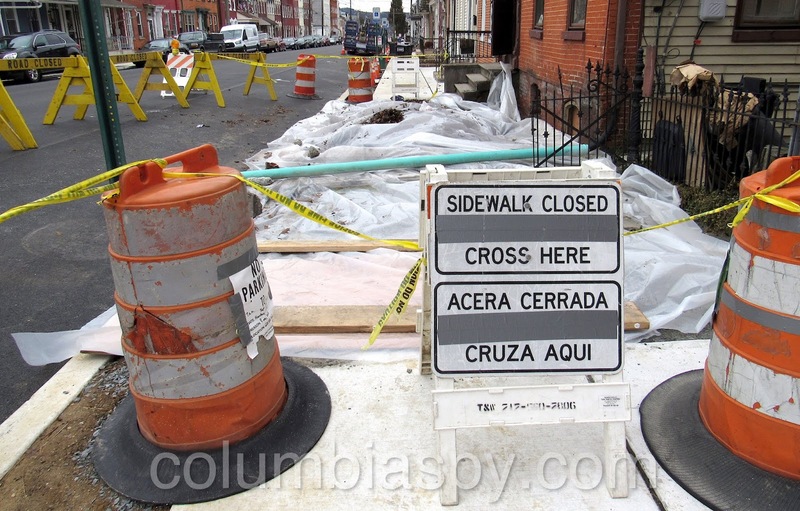 The sidewalks are part of an overall road project on the 500 and 600 blocks that includes road paving, curbs, and ramps. 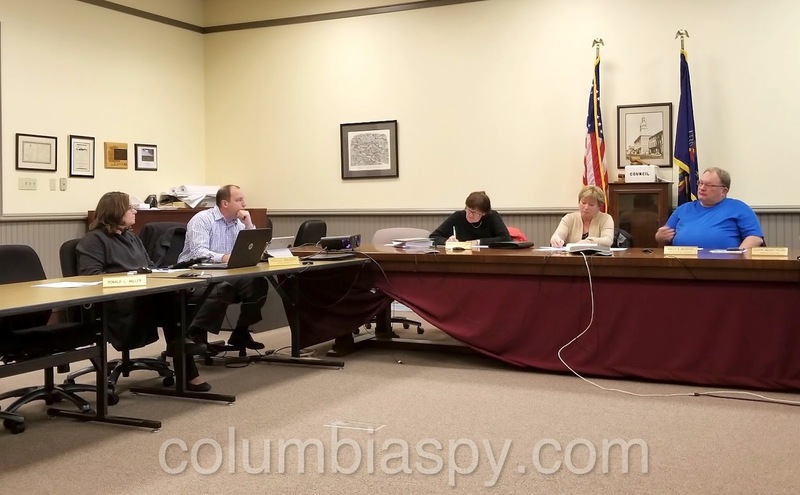 As Columbia Spy reported HERE, property owners on the two blocks complained to borough council recently about various problems with the project. C.S. Davidson's Derek Rinaldo (second from left) reports on the Walnut Street road project. Regarding concrete cracking, Rinaldo said, "We're not concerned with the integrity of the concrete." 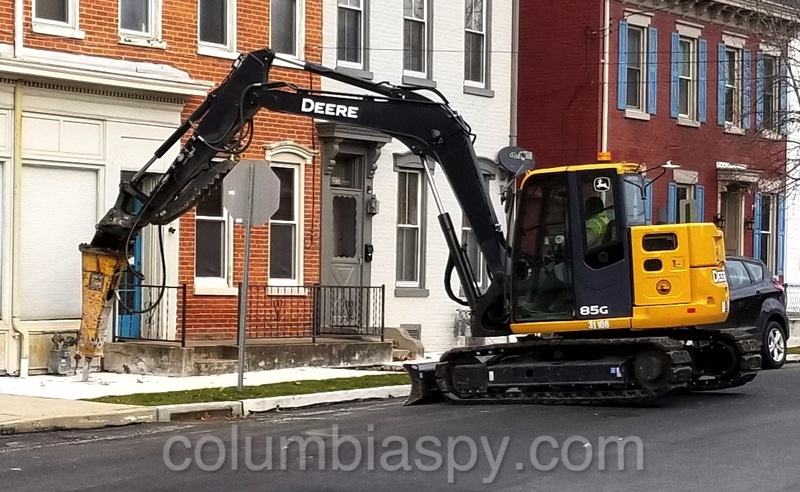 He pointed out that the concrete used for the job is rated at 4,000 psi and must meet borough standards based on PennDOT 408 specifications that govern various aspects of construction. Two sinkholes opened up on the 600 block. During sidewalk installation, another problem became apparent: a sinkhole that opened near 647 Walnut. Rinaldo said a urethane injection method is typically used to fill in any voids and spaces associated with a sinkhole. In the process, a spray foam is injected underneath the road and curb, which expands to fill the affected area. A second sinkhole opened this past Sunday, near 651 Walnut. Contractors are also filling in the so-called "beauty strips" with concrete. Rinaldo noted that water was flowing over the curb and onto the sidewalk during high-intensity rains. He explained that the problem stems from the fact that the 600 block of Walnut takes drainage from the three blocks further up as well as from several side streets. 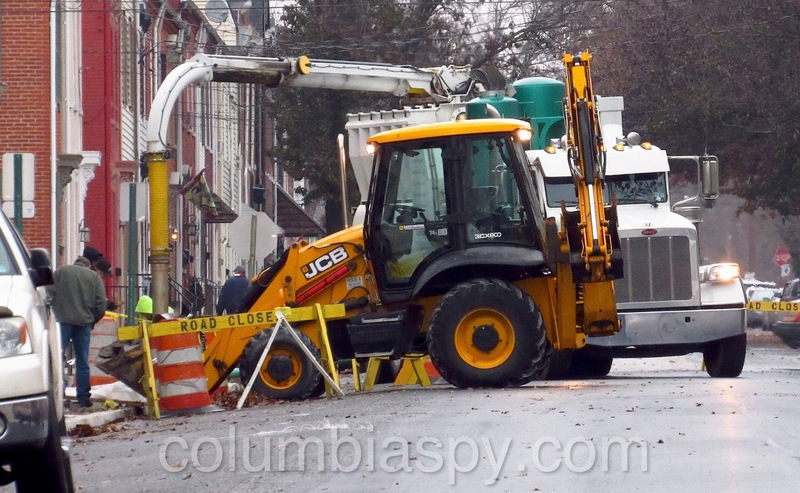 To help resolve the problem, drains will be added in the 700 and 800 blocks during next year’s planned road project. Contractors are also filling in the so-called "beauty strips" with concrete to control water. Another possible factor contributing to drainage problems, according to Rinaldo, is the street’s high crown. Unfortunately, lowering the crown would require tearing up and totally reconstructing the street, potentially adding several hundred thousand dollars to the cost. Rinaldo said testing and core samples of the street did not show a need for reconstruction, because the base is strong. Profile milling was done instead; that is, taking a very small amount of material off the top and replacing it with petromat, a fiber-containing paving material that provides an extra layer of strength over trench cuts and divots. Problems on the 500 block are also being addressed. Rinaldo explained that other jobs he's been involved with in the borough did not have these kinds of problems and that this is the third or fourth project he's done with Pennsy Supply. Pennsy installed the sidewalks on the 600 block, while a subcontractor, Sauder Brothers Concrete, did the 500 block. The total project cost for the two blocks was a little over $432,000. Rinaldo said no contractors have been paid so far. 400k to replace street and sideswalks? Over charged much? Them " beauty strips" better be laced with marble or something. Yes, concrete and labor to name a few are expensive. This bid was low end. Thats pretty cheap, obviously you never worked in road construction,,,that project was a full reconstruction!! Maybe the borough needs a new engineer , you can see the crown is way to high for the side walk height. Bet that engineer doesn't live on a street like this. A normal street you can pull a string across curb to curb and it touches in the middle (6inch slope) What is going on here. Borough is a union , don't they have to pay union wages?? It is a shame votech school didn't do the job it would have been better. The borough needs common sense , just look at the pics to much slope. Wait till a ice storm and watch people walking to there cars and try to pull out on the street.This is not rocket science ,looks like a lot of the job should be redone or no payment rendered . Would any of the 7 pay for this at there house , so way ours ? Maybe Jake can straighten this out , but it should not have happened in the first place , they can see flaking paint but not see the crap work that went on with duct tape etc.. WHERE WAS THE BOROUGH INSPECTOR , and what did the manager do ? They are spending our money , so somebody should check on the work. 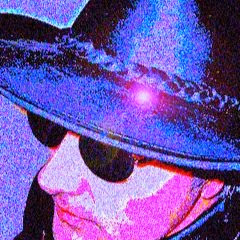 Why do you think Ron Miller is getting out as soon as he can! Feb. is his retirement!! Washing his hands on a lot of BAD DECISIONS!! I hope every one on those blocks has strong arms to close there car doors with the angle they are left with. seriously folks, it wouldn't matter if the street was lined in solid gold...you'd complain. there are always unforseen items on every job. i wish the people that have NOTHING to do BUT COMPLAIN 24/7, 365 would go get a job. Run for office. Go to council meetings. this is getting old. some of you are never and will never be happy...about anything. stop. True, there are unforeseen items. There is also poor workmanship and lack of oversight. It sounds as though you're saying people shouldn't complain if there's a problem. It's because of residents' complaints that the problems are being fixed. You can tell that the one commentor doesn't live on 500 or 600 walnut st , people should flood the borough every way they can or nothing will get done . ( look at the slope ) wait till someone gets hurt. What are acceptable slopes for road construction ? This seams to be exstream , look at the backhoe down in the gutter , the middle of that road needs milled down 8 t0 ten inches from looking at the pics. R Citizen we can tell you don't live on the street and tax payers are paying , the job should be done right. BET one thing if it was at the money pit it would be redone or stopped and done right the first time. I'm not an engineer by any means, but a little common sense tells me there is some truth and some crap in what I just read. Truth is that there is a terrible drainage problem "upstream" on Walnut St. The intersections are like crossing ditches instead of having storm drains. Why fill in the "beauty strips" to control water? If anything, they might absorb some of the water, whereas it will continue to flow right over concrete. Maybe they should just install dikes the whole way down the street. "We're not concerned with the integrity of the concrete." That's why it's cracking. So the concrete must meet standards? What's UNDER that concrete? I'm usually very positive about Columbia, but this Walnut Street fiasco may just deserve a criminal investigation. I fear lawyers may have a heyday if things aren't corrected properly. I am glad that company is not building a dam , concrete cracking does matter, did we pay for cracks? WHERE WAS the public works director when this was done. R citizen How do you know it was done to specs and the borough being union has a lot to do with the pay scale . 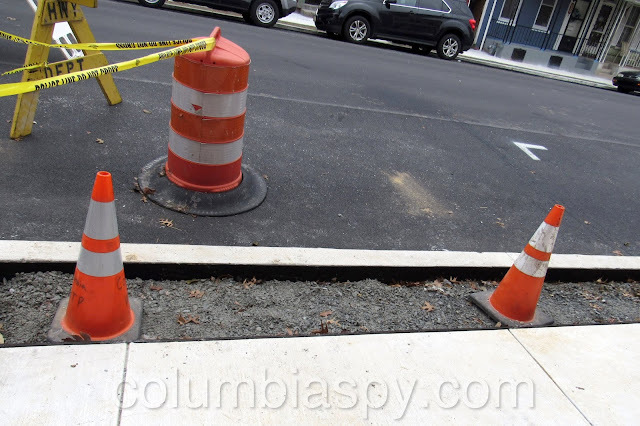 If the engineer oked this the firm should be fired , but contractor s that aren't watched do this kind of sloppy work and it looks like Columbia's inspectors were on the take or just not there, thru this job anyone could see the out come, so it seams they weren't there. Fill out a wright to know for the specs and see and tell us what you find. Are the storm drains large enough to support more water from upper blocks, if not the job should have been stopped until we put new drains in , now if they aren't (yup) dig it up again. WHERE WAS THE COLUMBIA INSPECTER AND HIS DAILY NOTES ON THE JOB??? BOROUGH MANAGER SHOULD ANSWER THESE QUESTIONS TO THE PUBLIC !! INEXPERENCED this is not going to be the last of these things , more to come, thank you council ,your back door shi- bites the tax payers again. this has been one of the rainiest wettest years on record, only topped once. that is a huge part of the problem pertaining to Walnut St. I'm NOT saying that the contractor did a questionable job. I'm sorry that this happened, but my point is, the Borough and it's Engineer are handling the issues, knowing there are problems and trying to correct them. You see, there are no magic balls that tell you when you are working on one item, that another sinkhole is opening up. This is an extreme common occurance the past few years, and Pennsylvania is near the top of the list. Give them the chance to have everything done correctly. The Borough didn't do the work, it was bid out. Let them do what needs done. how does one change the angle or pitch of a drain pipe. They saved several hundred thousand to leave the crown on knowing problems will happen ,BUT THEY SPEND MILLIONS ON THE MONEY PIT hum council ? mayor ? we are paying you people, and the borough manager ????? It's time something is done with the council and Mayor all they do is spend money and the Manager thinks we are a big city. She needs to get a better hold on things in this Small Boro. We also have too many employees for the size of our town. Clean out and save us TAX money.